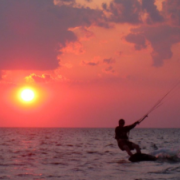 Instead of having to search for super useful threads like these, I felt it was a good idea having a forum dedicated to kiteboarding tips and tricks. If there's a thread you feel is especially useful describing some aspect of kiting, use the "Report this post" button at the top right of every post. It's a upside down triangle with an exclamation point (!) in it. I will be notified and will move the topic if appropriate. For examples of appropriate threads, refer to what those already found in this forum.